"Personalized Bangle Bracelet, Silver and Gold, Beloved Bangle"
This custom bangle bracelet has style, as well as meaning! The Beloved Bangle Bracelet is our best selling bracelet. It is so simple yet can be dressed up or down. 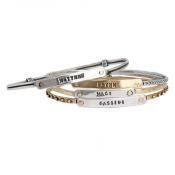 Mix the metals and stack them together to create your own personalized look! 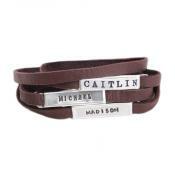 The above price is for a bracelet with a bronze cuff and nameplate. If you choose a different style the price will change. Choose from 4 different metal combinations to create your own look! 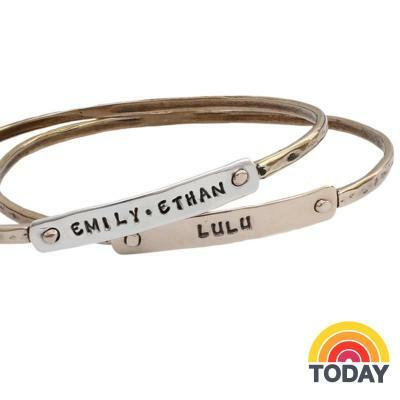 This personalized mother's Beloved Bangle bracelet is a simple way to show your love. We love the versatility of the metals ~ you can mix and match to create the perfect stack of bracelets. We offer four different metal combinations so you decide if you want to mix it up or match them all. Anything you decide will look great, and be meaningful to you! 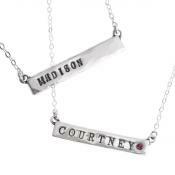 Stamp each child's name on a different style bracelet and create a unique stacking family bracelet. Or stamp just one child's name, a birth-date, an anniversary date or an inspirational word. The bracelets can be ordered in four different metal combinations. Please note, the letters on the bronze nameplates do not darken as much as on the silver nameplates. Because of the customization, you can only order one bracelet at a time. If you would like more than one of this bracelet, click add to cart and return to this page to customize your next bracelet. The price listed is for one bronze/bronze bracelet. If you change the metal combination the price will change. Small - Approx. 7.75" around. Large - Approx. 8.25" around. The cuff piece is approx 3mm wide and the stamped nameplate is approx. 1.25" x 1.25" and can be stamped with up to 11 characters/spaces in the Lizzy or Nelle fonts, and up to 7 characters in the block font. All bracelets are bangles and slide on the wrist. They do not have any type of release to open and close them. Need help with bracelet sizing? See the video below for sizing instructions. Because these bracelets are customized, all sales are final. All prices include stamping. We only use sterling silver and gold bronze in our bracelets. I have purchased these for each of my daughters each time they had a baby. They have all loved them so much and they seem to acquire a patina that makes them even more lovely as time goes on. One bracelet, after 5 years needed a repair and it was done quickly, expertly, and free of charge! "Stacking Bangle Bracelets, Silver and gold, Beloved Bracelets"
"Stackable Rings, Design Your Own Stacking Ring Set in Silver"